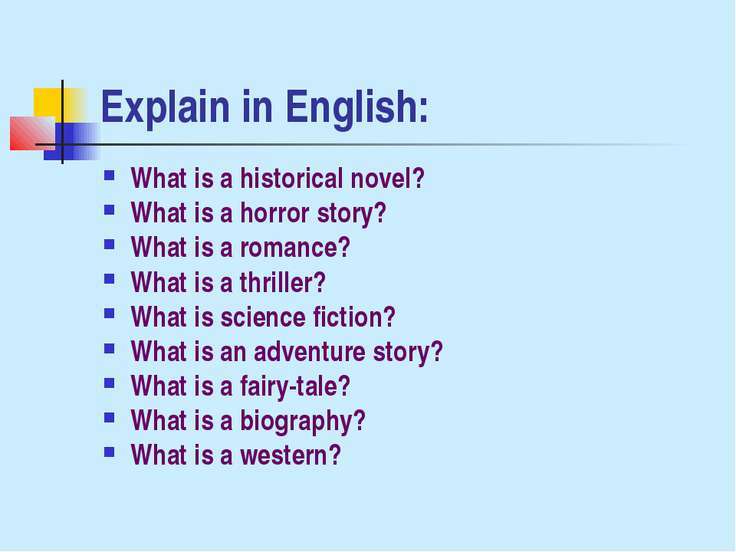 Explain in English: What is a historical novel? What is a horror story? What is a romance? 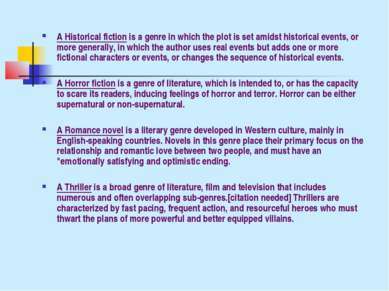 What is a thriller? 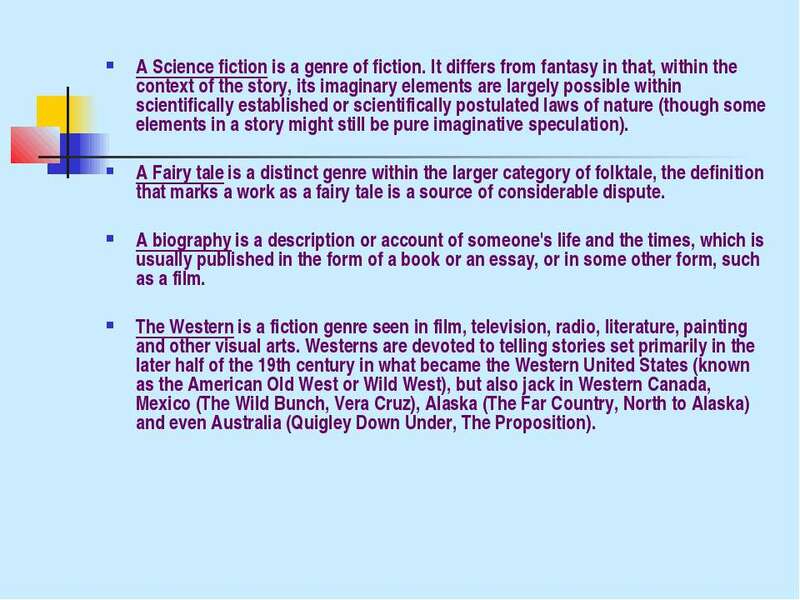 What is science fiction? What is an adventure story? 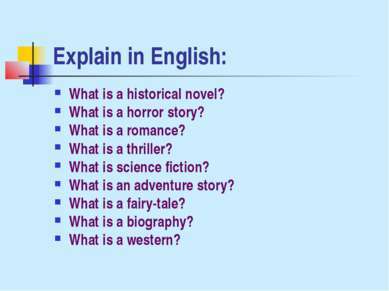 What is a fairy-tale? What is a biography? What is a western? 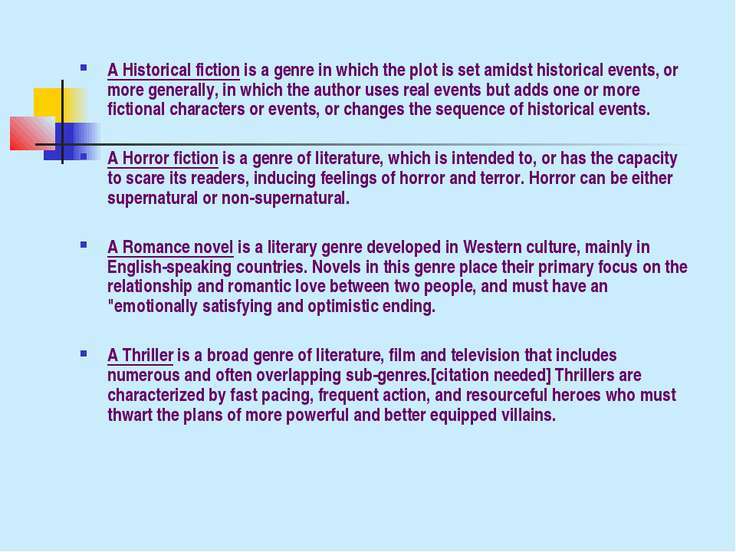 A Historical fiction is a genre in which the plot is set amidst historical events, or more generally, in which the author uses real events but adds one or more fictional characters or events, or changes the sequence of historical events. A Horror fiction is a genre of literature, which is intended to, or has the capacity to scare its readers, inducing feelings of horror and terror. Horror can be either supernatural or non-supernatural. A Romance novel is a literary genre developed in Western culture, mainly in English-speaking countries. Novels in this genre place their primary focus on the relationship and romantic love between two people, and must have an "emotionally satisfying and optimistic ending. 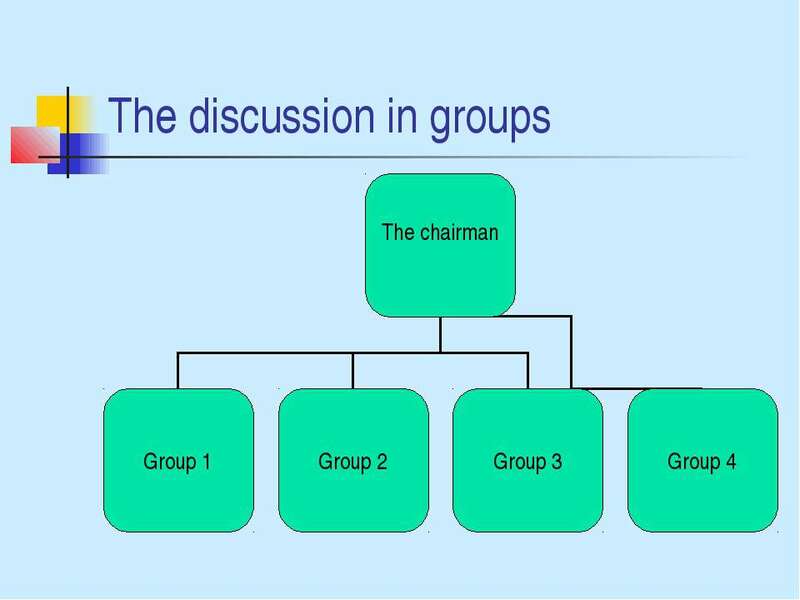 A Thriller is a broad genre of literature, film and television that includes numerous and often overlapping sub-genres. Thrillers are characterized by fast pacing, frequent action, and resourceful heroes who must thwart the plans of more powerful and better equipped villains. A Science fiction is a genre of fiction. 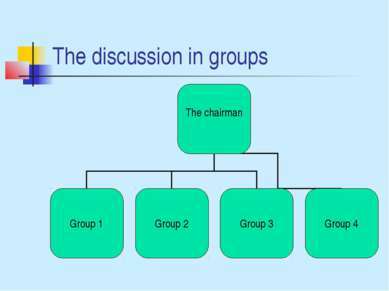 It differs from fantasy in that, within the context of the story, its imaginary elements are largely possible within scientifically established or scientifically postulated laws of nature (though some elements in a story might still be pure imaginative speculation). A Fairy tale is a distinct genre within the larger category of folktale, the definition that marks a work as a fairy tale is a source of considerable dispute. 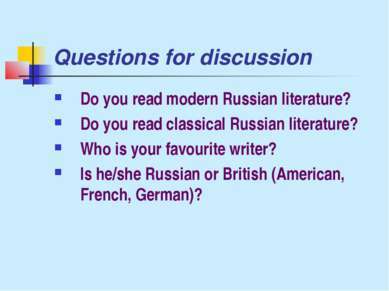 A biography is a description or account of someone's life and the times, which is usually published in the form of a book or an essay, or in some other form, such as a film. 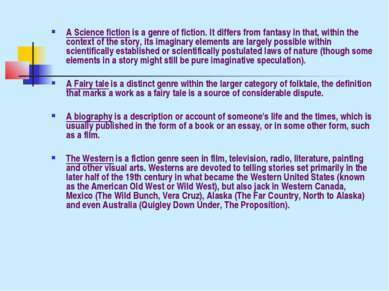 The Western is a fiction genre seen in film, television, radio, literature, painting and other visual arts. Westerns are devoted to telling stories set primarily in the later half of the 19th century in what became the Western United States (known as the American Old West or Wild West), but also jack in Western Canada, Mexico (The Wild Bunch, Vera Cruz), Alaska (The Far Country, North to Alaska) and even Australia (Quigley Down Under, The Proposition). Information for the chairman Let’s start Question 1 is Let’s listen to Kate Thank you And do you think, Igor? 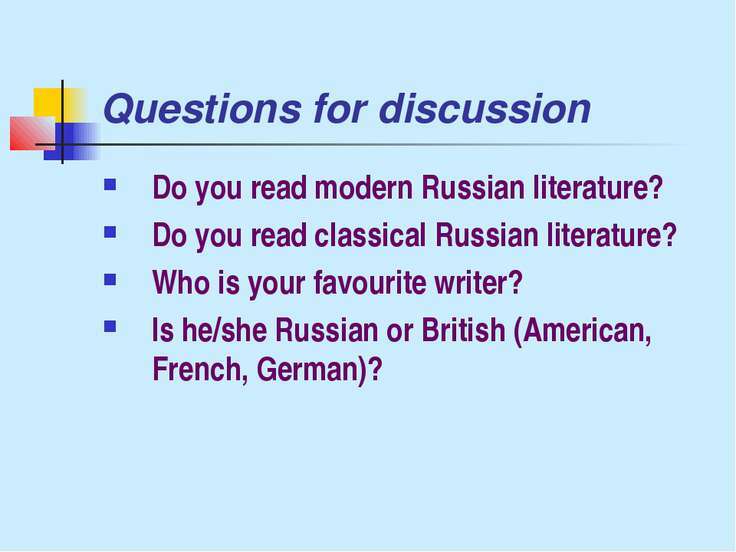 Questions for discussion Do you read modern Russian literature? Do you read classical Russian literature? 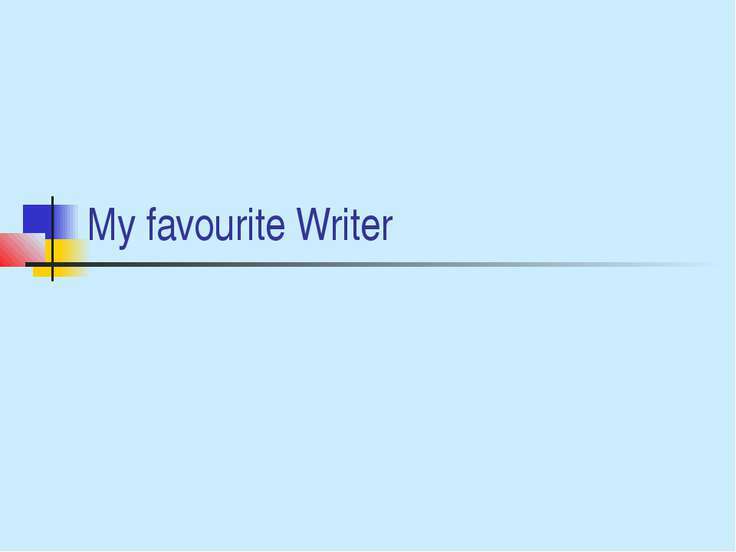 Who is your favourite writer? 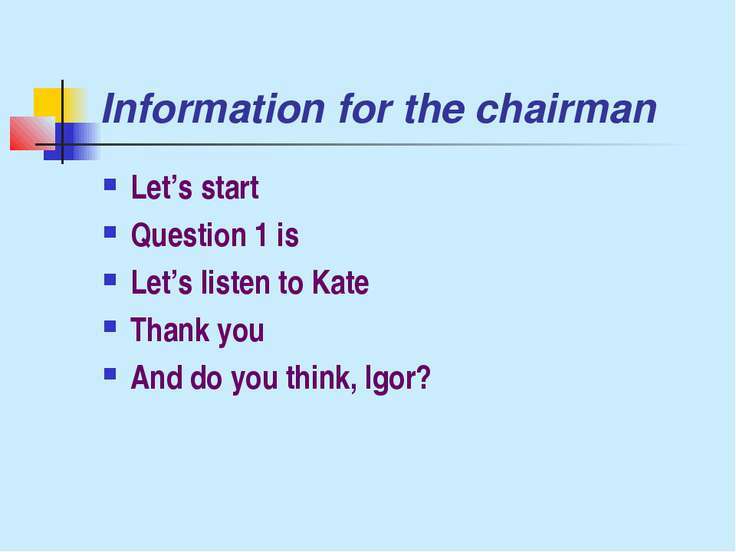 Is he/she Russian or British (American, French, German)? 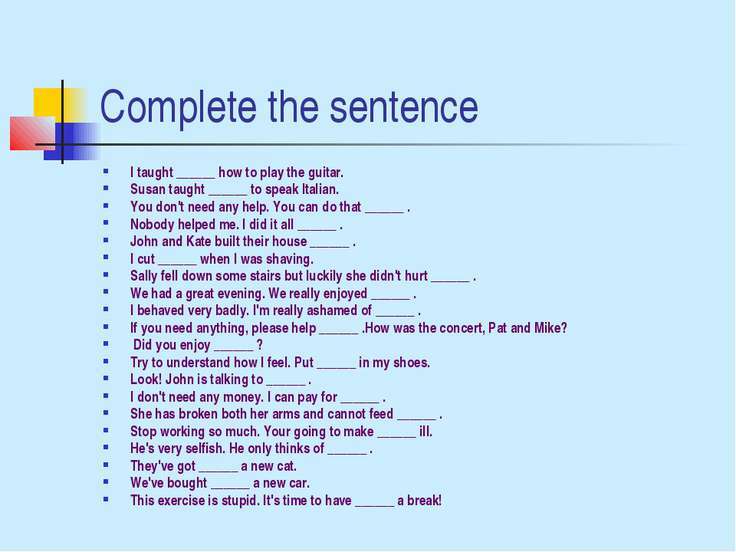 Complete the sentence I taught ______ how to play the guitar. 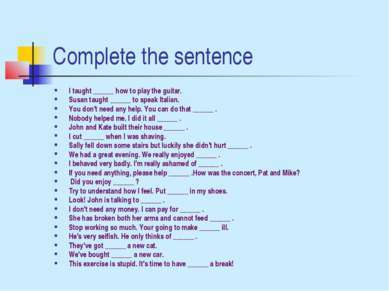 Susan taught ______ to speak Italian. You don't need any help. 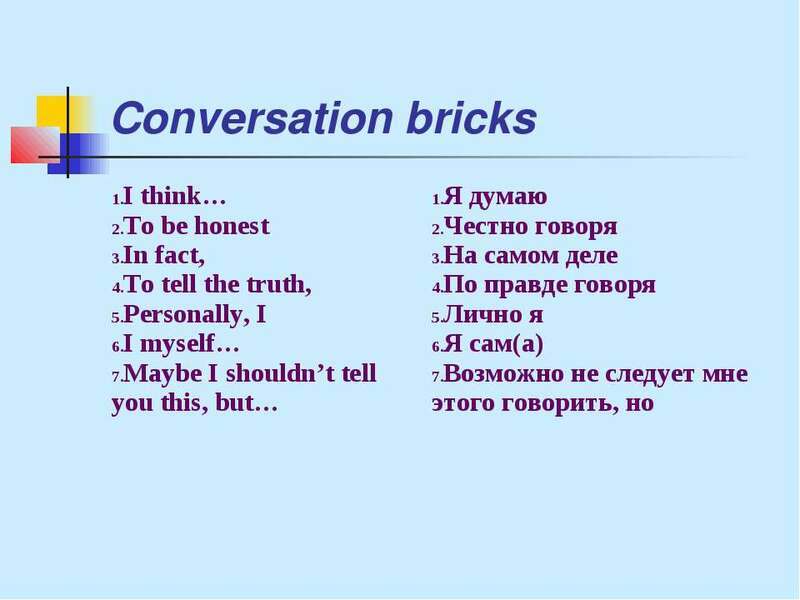 You can do that ______ . Nobody helped me. 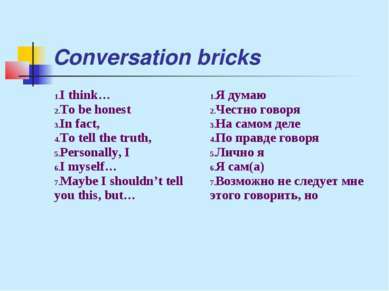 I did it all ______ . John and Kate built their house ______ . I cut ______ when I was shaving. Sally fell down some stairs but luckily she didn't hurt ______ . We had a great evening. We really enjoyed ______ . I behaved very badly. I'm really ashamed of ______ . 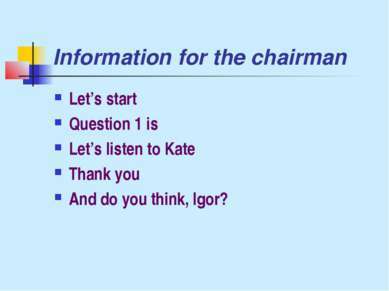 If you need anything, please help ______ .How was the concert, Pat and Mike? Did you enjoy ______ ? Try to understand how I feel. Put ______ in my shoes. Look! John is talking to ______ . I don't need any money. I can pay for ______ . She has broken both her arms and cannot feed ______ . Stop working so much. Your going to make ______ ill. He's very selfish. He only thinks of ______ . They've got ______ a new cat. We've bought ______ a new car. This exercise is stupid. It's time to have ______ a break!